There is a Dr. Seuss story about Christmas. You all know it. Frankly, it really is not my kids’ favorite. Who really wants to hear about a mean spirited goon who sweeps down upon a population pretending to BE Christmas, all the while stealing everything good about the real Christmas? Probably not you… but I am going to talk about Sarah Palin anyway. 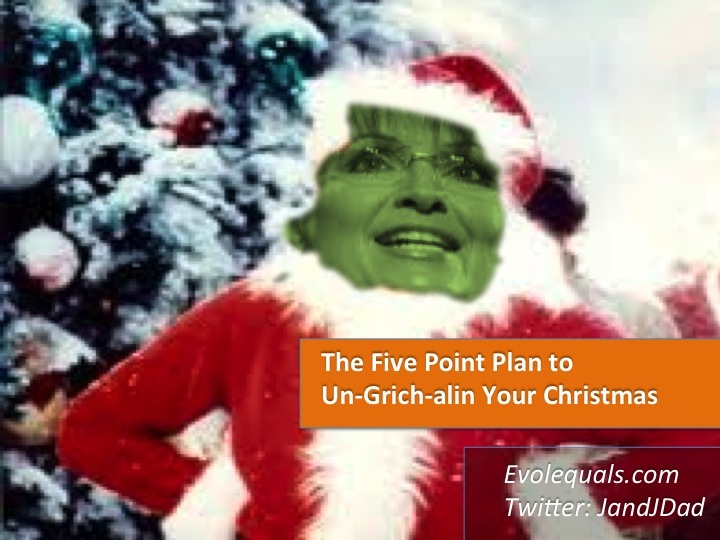 I may mention that Grinch guy too, although, I think he has been usurped by Ms. Palin this year. Their spiritual mind-meld makes me think of them as a single unit, the Grinch-alin. There. I put a name to it.